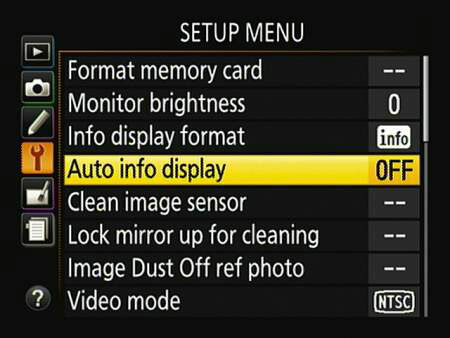 You can change the look of the Info Display on the Nikon D5200 or even keep it hidden. Just below the Info Display Format option on the Setup menu, the Auto Info Display option offers another way to customize the Information display. When this option is set to On, as it is by default, the Information display appears when you press the shutter button halfway and release it. And, if you disable the instant image-review feature (via the Image Review option on the Playback menu), the Information display also appears after you take a picture. Turn off the Auto Info Display option, as shown in this figure, and the screen appears briefly when you first turn on the camera, but after that, you must press the Info button or the Info Edit button to display it. Instructions in this book assume that you stick with the default setting (On). But because the monitor is one of the biggest drains of battery power, you may want to set the option to Off if you have a lot of shooting left to do and your battery is running low. Turn off this option to prevent the Information display from appearing automatically.